We’d love your help. Let us know what’s wrong with this preview of Pistols and Poplin by Kirsten Osbourne. Five brand-new sweet Western novellas by five of your favorite authors! No one wants to employ Doris Miller, and no man is interested in her. Traveling two-thousand miles across country to marry a stranger may seem strange to some, bu Five brand-new sweet Western novellas by five of your favorite authors! No one wants to employ Doris Miller, and no man is interested in her. Traveling two-thousand miles across country to marry a stranger may seem strange to some, but it’s the answer to her troubles. Harvey Butler’s children are the scourge of the town of Salmon, Oregon. When one of the women of the town insists he needs a bride, he’s certain he could never find someone willing to marry him. When he receives a response from Doris Miller, he’s convinced it will be a marriage of convenience, and they will simply coexist. Will Doris be able to change his mind about his future? Sybil James has worked her way up and is now employed as the ladies' maid for Lady Douglas, a wealthy woman of distinction. When Lady Douglas decides to travel to America to visit her son, she gives the girl a chance to see the world and experience things she could only dream about before. Grant Douglas is enjoying his life as an American businessman, all the while knowing that he'll eventually return to England to run the family estate. Circumstances force his hand early and he must drop everything to set things to rights--one of those things being the stewardship of a lovely young ladies' maid who finds herself without a home. Two very different worlds collide . . . two hearts must decide what it is they most want. Emmeline Weidner was left at the altar by her intended. Seeking to heal her bruised feminine ego, she moves in with her sister. While learning to cope with her new life, she discovers she isn’t content to live the life of a spoiled society woman. Can she let go of her newfound independence when the right man comes along? Lincoln Bass returns to Flat Rock Point, Arkansas a year after the accident that almost cost his life. His former employer has asked him for help at the lumber mill. He is apprehensive, but feels he owes the man who saved his life. Then he crosses paths with the most delectable, yet bewildering female he’s ever encountered. Assigned to a position in the newly formed Yellowstone National Park, life seems like it couldn't get any better for Ben Ferguson. But patrolling for poachers is fraught with danger, and he soon finds his future looking bleak. Images of a blue-eyed guardian angel are the only thing he has to pull him from the edge of death. Crazy. Worthless. Demon-possessed. Clara Youngblood has been labeled many things by people who cannot understand the challenges she must confront every day within her own mind. When all seems dark, a glimmer of hope appears in the form of a retired soldier. Ben and Clara wouldn't have chosen the circumstances that brought them together, but they soon discover their importance in rescuing each other. Chloe Taggart has one goal—to leave Rocky Ridge as soon as possible and see the world. She has no intention of ever being under a man’s thumb, and she has no desire to spend her life cooking and cleaning when she could be sailing the Pacific or touring ancient Greek ruins. To ask other readers questions about Pistols and Poplin, please sign up. I had such a delightful time with this group of five books by favorite Western Historical Romance authors, and some new faces as well. If you love the Brides of Beckham, then you’re in for a treat with Mail Order Miller. If you’ve enjoyed the Kansas Crossing series then you’ll be visiting with some old friends in The Risk and The Reward. Of course there were some stories that I loved and some I enjoyed. But overall this is one amazing group of story tellers who deliver some great stories, and add some interesting additions to loved series. 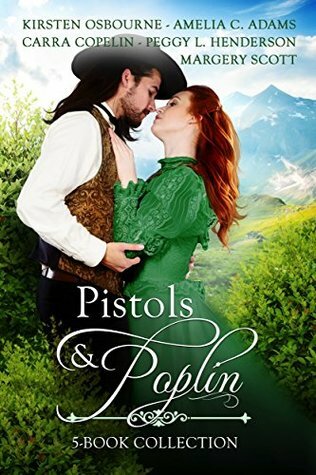 I have no problem highly recommending Pistols & Poplin to any Western Historical Romance reader. I really enjoyed the stories. The stories were really good. The problem I had was the mess up with Sybil and Grants story. It was not in the right order. Someone put it together wrong. They put the middle part around 80% part of the book. The first part is in the beginning and the end was put in the end of the beginning so it was confusing...I loved all of the plots of the stories but can someone fix the ebook? The only other area was after Austin won the diner Chloe went to his ranch the next da I really enjoyed the stories. A wonderful set of sweet romance stories that I think would be a perfect introduction for those embarking into historical western romances gene for the first time. Saying that I love this gene and equally loved theses story's but I believe I have already read one or two. I loved the characters the authors created and and the little world they took us too in each unique story. I recommend everyone to the books put together themselves, they won't be disappointed. It's truly wonderful when when you don't have to decide which author to read, cause they all got together and Pistols and Poplins is the result. If you're new to western romance, this is a great way to discover some of the best. Here's another plus. Some of these stories are actuality related to some wonderful series BT these gifted authors. Enjoy!! Very good box set. Each story had fantastic characters. These characters may have secrets, flaws, needed love they couldn't find sometimes on their own. Each story has it own tail. A great group of ladies got together to write these must read stories. I would highly recommend. I enjoyed reading each of these short stories and felt I was in the towns, on the ranches and in the homes of the main characters in the time period written about. It was hard to put the books down and I can safely recommend this collection to all. What a fun read! Loved all the books in the collection. Thank you to all the authors! It was a wonderful , fun read. The characters and stories were Great! A wonderful collection of stories by some talented writers. Each story held romance, drama and love. I saw so many possibilities for other stories for some of the characters. I can't wait. I got this book because it had a Peggy L Henderson book in it. I enjoyed the entire collection though and it flowed as if written by completely by the same author. All of the characters could have been friends! I could see myself reading any of these authors again! All five stories were unique. Stories of hardships but love at the end. Very enjoyable and heartwarming. Characters were well loved. What a wonderful surprise to find out some of my favorite authors were banding together in an anthology. All of the stories were great reads. Great box set. liked all five stories one more then others, but all had great characters and were enjoyable to read. What a great compilation of stories. Each match of couples and their romance was written with characters that are well portrayed. Five delightful stories that are very different yet each one tells a tale of a couple fumbling their way to happiness. And all of them marvelous! BoB!! Topeka! A little English Lord! Are you kidding?! All rolled up in this book! YES!